WARNING: **IMPORTANT UPDATE FEBRUARY 2019** Violent protests over alleged massive corruption in the present and some past administrations are occurring throughout the country since early July 2018, and have increased in frequency, violence, and size during the intervening months. The protests have directly resulted in several deaths and scores of injuries, as well as generalized chaos and difficulty of movement around the country, particularly in the area surrounding Toussaint L'Ouverture airport in Port-au-Prince, as well as downtown Port-au-Prince and Cap-Haitien. These areas can and, during periods of protest (which can occur unexpectedly), will very likely be host of a number of illegal roadblocks made of burning tires. Under no circumstances should anyone attempt to go through or around a burning roadblock, as many people who set them up are armed and likely to open fire. Resort areas which require transit through the main areas of Haiti to access have not been exempt from the chaos, although Labadee remains largely unaffected at the moment. Most western governments now have some sort of advisory against traveling to Haiti, including advice to avoid the country completely by the US and Canadian government. Though Haiti—the first and only nation to take it's freedom as a result from a slave revolution—is a beautiful nation, it is poor as well. For those with patience, revolutionary spirit and an open mind, Haiti reveals a rich culture that is unique among post-colonial nations. If you are planning on taking your family with you, it's best to stay in resorts, but try to go to richer areas such as Pétion-Ville (if you're in the Port Au Prince area). It is extremely helpful when travelling in Haiti to have a local contact, through a church, a hotel, or just through making friends with someone. Experiences like dining locally, riding on a tap-tap, or strolling through one of the insanely crowded outdoor markets are great fun and very worth doing but are much safer and easier if you have a trusted Haitian to go along as a guide and interpreter. Tropical and semiarid where mountains in the east cut off trade winds, Haiti lies in the middle of the hurricane belt and is subject to severe storms from June to November. Experiences occasional flooding, earthquakes and droughts. Haiti was inhabited by the native Taino Indians when Christopher Columbus landed on 6 December 1492 at Mole St Nicolas. Columbus named the island Hispaniola. The Taino were a branch of the Arawak Indians,a peaceful tribe that was weakened by frequent violent invasions by the cannibalistic Carib Indians. Later, Spanish settlers brought smallpox and other European diseases to which the Taino had no immunity. In short order, the native Taino were virtually annihilated. There is no discernible trace of Taino blood on Haiti today. The current inhabitants have exclusively African and/or European roots. In the early 17th century, the French established a presence on Hispaniola and in 1697 Spain ceded the western third of the island to France. Through the development of sugar and coffee plantations, the French colony of Saint-Domingue flourished, becoming one of the wealthiest in the Caribbean. Enslaved Africans were brought to Haiti to work on these French plantations. Work conditions for slaves on Haiti were the harshest imaginable, as sugar and coffee plantations required intensive labour. The French imported an enormous slave labour force, which ultimately vastly outnumbered the French planters 10 to 1. In August 1791, many of Saint-Domingue's nearly 500,000 slaves revolted, burning many plantations to the ground and killing many whites. After a bloody 13 year struggle with the French slaveholders, poorer French whites, free mulattos, and certain free blacks, the former slaves ousted the Napoleonic French, Spaniards & English armies and created Haiti, the first black republic, in 1804. It needs to be understood that Haiti is the second-oldest country in the Americas, 28 years younger than the United States. After independence and with encouragement from the British looking to drive a wedge between the French and the former colony, all the whites were killed and whites were banished from the island for decades to come. France imposed a crushing indemnity on Haiti in 1825, forcing the small island nation to pay the equivalent of 12.7 billion 2014 dollars to France for lost property due to the revolution. Once the wealthiest colony in the world, the civil war that led to independence and French indemnity payments left the country isolated and utterly devastated. Since its revolution, Haiti has had at least 32 coups and a series of military dominations that focused on maintaining power and extracting wealth from a large peasant base. A lack of government and civil unrest led to the American occupation of Haiti from 1915 to 1934. While order was brought about and much infrastructure was developed in Haiti by the United States, Haitians resented the occupation of their country. The withdrawal of Americans by President Roosevelt in 1934 left a power vacuum that was filled by Haitian military elite. The Forbes Commission in 1930 accurately noted that "the social forces that created [instability] still remain--poverty, ignorance, and the lack of a tradition or desire for orderly free government." The following 20 years saw ruthless struggles for power that ended with the ascension of François (Papa Doc) Duvalier. Duvalier's brutal dictatorship lasted nearly thirty years, with his son, Jean-Claude (Bébé Doc) Duvalier assuming power after Papa Doc's death in 1971. Bébé Doc was ousted in 1986, followed by more bloodshed and military rule that culminated in a new Constitution in 1987 and the election of former priest Jean-Bertrand Aristide as president in 1990. After a coup, Aristide went into exile. Most of his term was usurped by a military takeover, but he returned to office in 1994 after Haitian General Raoul Cedras asked the United States to intervene, negotiating the departure of Haiti's military leaders and paving the way for the return of Aristide. His former prime minister, René Préval, became president in 1996. Aristide won a second term as president in 2000, and took office early in 2001. However, accusations of corruption were followed by a paramilitary coup that ousted Aristide in 2004. Since then, Haiti has been occupied by UN peacekeeping troops (MINUSTAH). In 2010, an earthquake struck Haiti's capital. Haiti's population center at the heart of the country—the sprawl surrounding the capital, and lands to the north. Home to the country's most important cities outside the capital, as well as the foreign tourist's favourite beaches near Cap-Haïtien. The Caribbean side of the country is the nation's less hectic region, with the up-and-coming Haitian backpacker destinations of Jacmel, Port Salut, and Île à Vache. Gonaïves — here, on 1 January 1804, Jean-Jacques Dessalines signed Haiti's Act of Independence, establishing the world's first black republic. The cathedral there is it's most popular landmark. Les Cayes — Southern Haiti's principal port and a popular jumping off point for Île à Vache. Also a great place for water activities. Port-de-Paix — Quiet city, with the opportunity to hail a ferry to Tortuga Island, a virtually undiscovered tropical paradise— a place with a history of having pirates around this land. Port-Salut — President Aristide's birthplace, home to miles of gorgeous, empty white sand beaches. 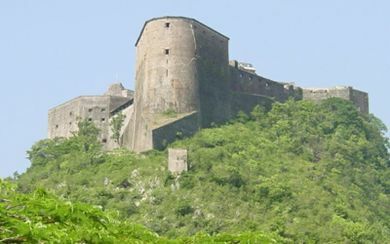 The Citadelle Henri Christophe (also known as Citadelle Laferrière) is a fortress located on a high mountain in Haiti overlooking the city of Milot, Haiti. At the base of the mountain stands the ruins of Palais Sans Souci. Labadie - a private port used by cruise ships. The 27 historic vestiges of Mole Saint Nicolas, North West, a strategic bay at the enter of Canal du Vent, also called Gibraltar of America. Good site for sports too (wind surf, kite surf, mountain bike, hiking..). Forêt de Pins - a pine forest in the South East of Haiti containing the highest mountain in Haiti, Pic La Selle. Visas are required only by citizens of Colombia, Cuba, the Dominican Republic and Panama. However, citizens of Colombia, the Dominican Republic and Panama may enter visa-free for three months if they have a valid United States, Canadian or Schengen visa or resident permit. Citizens of other countries can stay for three months without a visa. There is a regional airport in Jacmel, but it doesn't have a regular flight schedule. From Santo Domingo, Caribe Tours runs a once-daily bus to Pétion-Ville (in the hills above Port-au-Prince) that leaves at 11:00. A ticket costs USD40 one-way, USD26 tax and and DOP100. Unfortunately, this bus drops you off in Pétion-Ville after dark so make prior arrangements with a trustworthy person to meet you and transport you to your lodging. Another, less expensive, option from Santo Domingo to Port-au-Prince, is to take a gua-gua (Dominican minibus) from Santo Domingo (departing a few blocks north of Parque Enriquillo) for DOP380 (about USD10, 5h) and arrive in the border town of Jimani. From there, it is a 4km walk or a DOP50 ride by motoconcho to the border post. 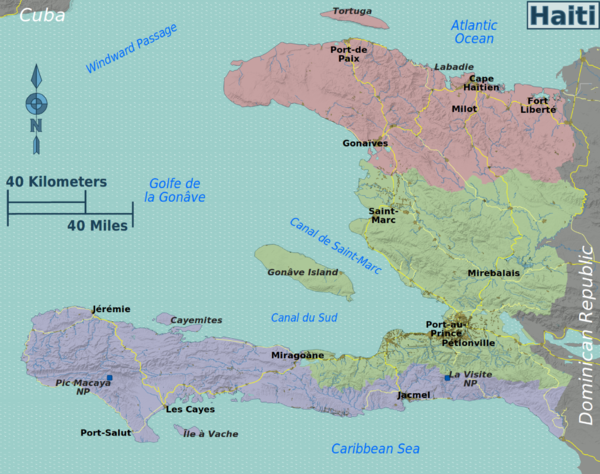 The northern border crossing is located between the Dominican town of Dajabon and the Haitian Town of Ouanaminthe. Dajabon is easy reachable from Santiago, it will be a 225 DOP bus ride and will take you around 2-3 hours. From Dajabon you can walk to the border crossing, which is a bridge above a river. Get your passport stamped and pay the exit fee (March 2018: 1000 DOP) and walk across the bridge. There you can change your money for a good rate. Then you have to pass a gate. This gate is pretty often closed, so that the border crossing is literally just a door. You can imagine how pushy it can get if everyone wants to pas this door, especially because lots of people passing with their motorcycle or tons of goods. After you made it through, visit the Haitians border crossing, fill out the green form and pay the entry fee (March 2018: 600 Gourdes). Then eather pay a motorcycle or walk the two km to the tap tap station. From there you can get tap taps to Cap Haitian for 125 gourdes. The border is apparently open 09:00-18:00 (but don't rely those times). It is very easy to cross the border without submitting to any immigration procedures on either side, and although it would probably be illegal, it saves a few dozen dollars on bribes and is much faster too. Apart from entering the DR when a soldier takes a look at the passport, nobody does any inspection: immigration or customs. Entering Haiti legally is quick: fill out the green form and pay whatever amount the official asks (around DOP100). There are no ATMs at the border. Moneychangers give Haitian gourdes in exchange for Dominican Republic pesos and US dollars. Rates are fair. There is plenty of local transportation from the border to Port-au-Prince. Crowded tap-taps and buses can take you to Croix-des-Bouquets for HTG50 (1.5-2h), from where it is another hour to Port-au-Prince proper (bus, HTG5). The road has variable conditions and and is prone to flooding. Peruvian UN soldiers at the border have confirmed that the road to Port-au-Prince is safe to travel with no incidents of robbery or kidnappings, but definitely try to arrive in Port-au-Prince before dark. You can hire a chauffeur to drive you around while you are in Haiti. It is more expensive than a city bus or tap-tap, but is similar to renting a car. Chauffeurs own their own vehicles, usually 4-wheel drive, and can take you most any place you want to go. There are very few road signs so it is difficult to navigate the roads without help. Chauffeurs can also interpret for you and recommend places to eat and stay. When looking for a driver, the Oloffson is an easy place to start; drivers often hang around the driveway looking for fares. Regardless of where you stay, it is easy enough to have the front desk phone a taxi, which will most likely be driven by a friend or a relative. If you have the chance, Alix Toyo is a particularly reliable and fair driver, who is full of interesting stories about the various visitors and celebrities he has driven around the country. If you are lucky enough to find Toyo, be sure to ask him about the time when he drove Jean Claude Van Damme to Jacmel. Very amusing. Cars may be rented through Hertz, Avis, etc. Taxis in Haiti are usually in the form of SUVs or trucks, as most of the roads are long overdue for repairs, in addition to plethora of unpaved roads one faces while travelling in Haiti. The price is often fair (i.e., HTG450, or USD11.53 at 39 gourdes to a dollar, from Port-au-Prince to Léogâne), but offers safety and comfort that cannot be found in riding tap-taps or buses. Tap Taps are the most economical way to travel in Haiti. Haitian tap-taps are modified trucks or vans and are ubiquitous throughout Haiti. A raised wooden canopy-like cabin usually sits over the truck bed while wood benches are attached to the bed and serve as seats. Tap-taps are frequently painted bright colours, and often bear a religious slogan, such as Jesus vous aime ("Jesus loves you"). In Port-au-Prince, most routes cost 10 gourdes (USD0.25). They are also quite convenient as they will stop anywhere along the route: simply yell "merci!" to get the driver to stop. However, they are sometimes overpacked and can be quite dangerous to ride in the mountain roads where the road conditions are less than ideal. First time travellers who do not speak conversational Creole are advised not to travel by tap-tap without assistance. There are also school bus versions of tap-taps used for longer voyages. These are often modified school buses. A more comfortable alternative for long distance travel are minibuses. These congregate at various lots throughout the city, organized by destination. Seats to Jacmel, for example, cost about HTG150 (USD3.75), while the more comfortable front seat may go for 200 gourdes (USD5). The official languages of Haiti are French and Haitian Creole (Kreyòl Ayisien), which is a French-based creole language, with 92% of the vocabulary being derived from French and the rest primarily from African languages and native Taino, with elements of Spanish. Haitian Creole is the native language of the masses, while French is the administrative language, even though only 15 % of Haitians can speak it and only about 2% can speak it well. Creole is mutually intelligible with French on the most basic level, so the competent French speaker should be fine in limited circumstances. Many Haitians are very appreciative if you take the trouble to learn a little bit of one of the official languages (preferably Creole), rather than using an interpreter or expecting them to speak English. Haitians working in tourist areas usually speak English well enough for conversation. In towns along the border with the Dominican Republic, it is easy to find people who speak a conversational level of Spanish. Mission groups/teams often find a translator very helpful in order to communicate during their trips. Labadee is a resort leased long term by Royal Caribbean International. Although sometimes described in advertisements as an island in its own right, it is actually contiguous with the rest of Hispaniola. Labadee is fenced off from the surrounding area. The cruise ships arrive and dock at a newly constructed pier. Attractions include a Haitian Flea Market, traditional Haitian dance performances, numerous beaches, water sports, and a waterpark. But be aware that you have to pay to get inside. Also be aware that Haitians are not allowed to come inside, so almost all your spendings go to Royal Caribbean International and not to the people of Haiti. Lately the city of Jacmel, due to its reputation as being less politically volatile, its French colonial era architecture, its colourful cultural carnival, pristine beaches and a nascent film festival has been attracting local tourists and a small amount of international tourism. The main attraction of Haiti is for sure the Citadelle La Ferriere, which is the largest fort of the americas. It was build as a safety measure against attacks from France, after the people who were brought to Haiti as slaves and their descendants defended themselves against the French colonialists and established the first black republic. The fort itself was located in the kingdom of North Haiti, which was ruled by Henri Christoph, one of the leaders of the former slave rebellion. The fort is a piece of Haiti’s rich history and should be treated with respect while visiting. It also lies on top of a mountain, which will also give you the opportunity to enjoy the best view over Haiti. At the bottom of the mountain you can find also the ruins of the castle Sans Souci, in which the wife of Henri Christoph used to live. For getting there go to the gas station behind the man tap tap station in Cap Haitien and ask for a tap tap to Milot. It will cost you 25 Gourdes. Once there, eather take a moto taxi or hike the 7 km up to the Fort. I feel you want to take a moto, don’t pay more than 150 Gourdes. They will drop you the entrance from the Fort. From there it’s still a two kilometers hike until the Fort. You can take a Horse for 20 dollars or walk. The entrance will cost you 5 dollars for the fort and 5 dollars for the castle. Visit when it’s officially closed, then you can just walk in without paying. Well worth the visit. Despite obstacles, Haiti's rich culture and history has allowed the country to maintain a moderate and potentially rising tourist industry. For the most part independent travel around Haiti is not really practical or recommended, however there has been a slow revival of tourism since the earthquake. Tour Haiti is one of a few travel companies based in Port-au-Prince and is a useful point of call if you are planning a trip to Haiti. Palais San Souci - This palace is what was left of King Henri Christophe's huge Versace styled castle. You can tour around and take many fun pictures! Musée Ogier Fombrun - This museum is located on Haiti's beautiful coast, Cote des Arcadins. It is also apart of the hotel/resort by the name of "Mulin Sur Mer". The museum includes old documents, weapons, uniforms, and a slave plantation replica. This is quite a place for the history lovers. Art Galleries - You will come across many art galleries when in Haiti, all with breathtaking art. Cathedral de Cap Haïtien - Classic Spanish architecture with a playground in the front. The Haitian gourde (HTG) is the currency of Haiti. Although merchants are required to quote prices in gourdes by law, virtually everything is priced in "dollars"--not US but Haitian dollars, equivalent to 5 gourdes. This practice is a holdover from the US occupation of Haiti in the early 20th century, during which the gourde was pegged at 5 gourdes to the US dollar. Haiti has become famous for its very informal yet interesting bustling marketplace. Everything is sold here ranging from the curiously appealing to the dullest of objects for rather inexpensive prices. Haggling is both wise and recommended, as most Haitians will charge foreigners at least double the market rate. There are various large retail supermarkets in the capital that offer a variety of items at fixed prices. Haiti has a world of crafts waiting to be sought after. You will best be able to find stores and legitimate shops in certain hotels and resorts. Haitian cuisine is typical of Caribbean métissage, a wonderful mix of French and African sensibilities. It is similar to its Spanish Caribbean neighbours yet unique in its strong presence of spices. Roast goat called 'kabrit', morsels of fried pork 'griot', poultry with a Creole sauce 'poulet creole', rice with wild mushroom 'du riz jonjon' are all wonderful and tasty dishes. Along the coast fish, lobster and conch are readily available. Haiti has a very fine collection of fruit including guava, pineapple, mango (Haiti's most prized fruit), banana, melons, breadfruit, as well as mouth watering sugarcane cut and peeled to order on the streets. Restaurants in the bigger cities provide safe and delicious meals, and precautions are taken with the food and water to keep things safe. A Haitian typical meal usually contains rice (usually brown or white). A popular meal you might find is pressed fried plantains, fried pork, and a cole-slaw like topping commonly known as "pikliz". Haitian street vendors also serve delicious food as well, particularly fried foods. Be sure to watch them cook the food, and it's best that you ask the vendors to fry their foods well-done, especially if it's meat. However, even in resorts with purified water, it is not always safe to assume that raw vegetables (such as lettuce and tomatoes) have been properly washed. In smaller or more humble venues make sure to eat fruit and vegetables that can be skinned or peeled, drink bottled drinks only, make sure any ice is from a clean water source, and make sure any meat is well-cooked. When bottled water or boiled water is not available, a freshly opened coconut provides water and electrolytes with minimal health risk. Tap water should be avoided. Drink bottled water only. The legal drinking/purchasing age of alcoholic beverages is 16. Haitian rum is well-known. 'Barbancourt 5 star' is a top drawer drink. 'Clairin' is the local firewater made from sugarcane that can be bought on the street, often flavored with various herbs that can be seen stuffed into the bottle. 'Prestige' is the most popular beer, and is of good quality and excellent taste. Also be sure to try the 'Papye' drink, a sort of papaya milk shake that is deliciously refreshing beyond words on a hot day. Cremas is a tasty, creamy alcoholic beverage that is derived from coconut milk. Guest Houses - There are many guest houses throughout Haiti. However, these are quite hard to find while overseas. Many of these guest houses run about 25 to 35 dollars a night and include 2 to 3 meals during the day. Sometimes these houses are associated with orphanages (such as Saint Joseph's Home for Boys). Camping - Camping is an activity to becareful with if doing so in Haiti. It's best to stay near authorities when doing so. Furcy Forest is a great place to do this activity, as well as some of Haiti's other national parks. Remember to take all precautions seriously, and watch everything closely. Hotels - there are several very nice hotels and resorts in Haiti. In Port-au-Prince there is Le Plaza which is in the heart of the city. It is a very comfortable place to stay and has a nice restaurant. Staff speak English to varying degrees. Another very nice hotel is Visa Lodge, which is near the airport. It also has a restaurant and a swimming pool. The staff also speaks English and they accept American money and credit cards. A classic hotel worth visiting even if you do not stay there is the Oloffson, in a French planter's home (these homes are the most interesting colonial buildings in Haiti). However, it has not been well maintained, and service is mediocre at best. Big, commercial hotels have also landed in Haiti as well. Royal Oasis has came to Haiti (specifically Port Au Prince) along with the newly built Marriot, Best Western, and the Hilton which will be finished next year. Haiti is home to NH El Rancho, which includes a casino. In the north near and in Cap Haitian new hotels are being or are built to service a resurgence in tourism to Haiti. Current ones there that are very nice are Roi Henri Christophe Hotel, Habitation Joussaint, as well as Mont Joli Hotel. Jacmel, will soon be home to new hotel chains in the coming year or so. You can learn many things while traveling to Haiti, professionally, or unprofessionally. Haiti has a museum located in Port Au Prince where you can learn about Haiti's history. This includes learning about the founding fathers of Haiti, defense tactics they used, old documents, and even the crown of Henri Christophe who ruled north Haiti in the 1800s. 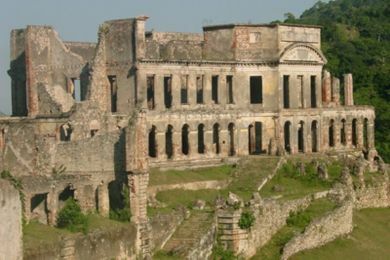 The Citadel and the Palais San Souci are also great ways to learn about Haiti's past history. The fort includes many cannons, cannon balls, old weaponry, and many other things to learn from. Tour operators can help you with understanding some of the stuff you can find there. The most work you can do in Haiti is missionary work. That can be running orphanages, adoption centers, building houses, supplying food, and over all sending aid. It's good to learn Creole or French so it's easy to communicate. Please think twice before joining such a mission, often the impact can be more harmful than good. IMPORTANT UPDATE FEBRUARY 2019** Violent protests over alleged massive corruption in the present and some past administrations are occurring throughout the country since early July 2018, and have increased in frequency, violence, and size during the intervening months. The protests have directly resulted in several deaths and scores of injuries, as well as generalized chaos and difficulty of movement around the country, particularly in the area surrounding Toussaint L'Ouverture airport in Port-au-Prince, as well as downtown Port-au-Prince and Cap-Haitien. Most western governments now have some sort of advisory against traveling to Haiti, including advice to avoid the country completely by the US and Canadian government. Although Haiti is not the most dangerous nation in the Caribbean, one should exercise some caution when traveling alone. When traveling to Haiti, be sure to keep up with latest news. Demonstrations can happen, but aren't very common. It's not the best to travel at night, but there are tourist, police, and UN officers marching around, especially during the night. Be sure not to carry large amounts of money, or show in some way that you have a lot of money on you. Though it does not happen much, you can risk being mugged or injured. Be especially careful when carrying money around beggars. Sanitary conditions in Haiti are poor. Tap water should be avoided. Drink bottled water only. Health care, while well below the standards of that in developed countries, is available in all large towns and cities. Many smaller towns and villages also have health clinics. However, medical equipment and a wide variety of medicines may be in meagre supply. The biggest concern in Haiti for travellers is malaria, and dehydration. One should make an appointment with a travel clinic for anti-malarial prophylaxis. Hydration requirements can be fulfilled by preparing one of the many water purifying systems as if one were going camping or by buying bottled water once in Haiti, which is widely available and inexpensive by western standards. Washing oneself with water from places such as creeks or lakes is not recommended due to the risk of water-borne diseases. Depending on your itinerary, you may have to walk a lot. Comfortable footwear is crucial for avoiding blisters. Hiking boots are recommended as well as comfortable sandals. One thing a missionary or other visitor to Haiti learns very quickly is that Haitians are a very dignified people; they have their pride, despite all they have had to endure. There are some beggars and pedlars in the cities, but they are the exception, not the rule. Expect no kow-towing. Impoverished Haitians will always accept gifts, but they will almost always stand straight, look you in the eye, and repay you with a sincere "Mesi" (thanks). Haiti is a nation of fairly conservative norms. Modest dress when exploring Haiti's cities is advised, especially for women. The smart visitor should look people in the eye, wave hello, and treat them with friendship and respect, as equals, no matter how poor or desperate their living conditions may seem. Try to learn some basic words of Haitian Creole. Ask permission before taking pictures of locals (they often ask you for money). Never walk about sticking your camera in people's faces or taking pictures randomly. Do not solely take pictures of the piles of trash you may see in some of the bigger cities (such as Cap-Haïtien or Port-au-Prince) or anything else that Haitians are not proud of as it is offensive. However, people have no problem with foreigners taking pictures of beautiful scenery, cultural events or historical sites. Carry a few gourdes in your pockets for the kids who carry your luggage/shine your shoes/hail your tap-tap at the airport (but be alert for pickpockets). Sometimes visitors to Haiti walk about handing out candy or dollar bills. While many people, especially children, will accept your offering, this is offensive to most people as it compromises the dignity of Haitians. Carry an extra water bottle and food to share with your driver, guide, or interpreter. Be patient as nothing moves fast in Haiti. Most people will find your whining amusing at best and severely insulting at worst. Carry a few photos of the area where you live, your workplace, or your family to share with friends you make. These are the things that transform you from just another tourist into a real person. More often than not, the people will return the favour, and you might just find a friend. Your emotions are real. It is okay to feel overwhelmed if you have not experienced this type of culture difference before. If you are easily affected by signs of poverty, Haiti is not for you. Be polite but not intrusive. It is normal to ask questions of the locals. Remember that you are a guest in their country. Do not expect to be treated as a king or a queen (though you might get some extra privileges) because you are foreign. Haitians are warm and helpful people. The people on the Gonâve Island have quite possibly less contact with Westerners than say those Haitians in Port-au-Prince. The children shout "blanc, blanc, blanc" as you walk by - if you happen to be a non-African descent (European, Asian, etc). The children on the saline flats will readily walk with you, show you how to skip stones off the water and try very hard to communicate with you. They may try to charge you for picking up a shell from the flats and up to USD6 to take a picture of their donkey. You do not have to pay, but out of respect, do not take the picture. They appreciate being asked if you may take their picture. This page was last edited on 9 April 2019, at 22:57.